The IBM Type 602 Calculating Punch, 1946. This electromechanical device performed addition, subtraction, multiplication, and division on data read from its built-in card reader, punching the results on the input cards themselves, or on subsequent cards, according to instructions from its plugboard program. Speed: 100 cards per minute. 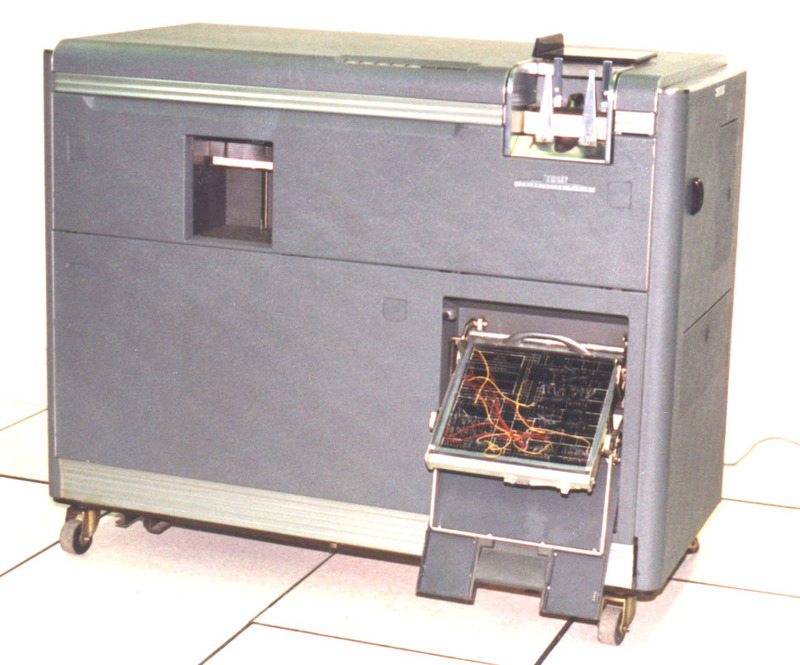 This was the first IBM machine to perform division. Photo: IBM 602-A Manual; CLICK to magnify The 602 did not perform reliably in the field, and by 1948 was upgraded to the 602-A (a "602 that worked", designed by George Daly). This was the last of IBM's electromechanical calculators. 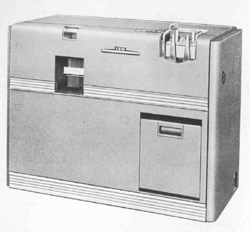 The -A model is distinguishable from the original 602 by its V-necked input-card hopper, the little viewport above the output hopper, centered nameplate, and lower-slung racing stripe. It also had an entirely different control panel. For another photo of the 602-A and a bit more description, see the Ellie Krawitz paper . To see a typical 602-A control panel wiring diagram (in this case for crossfooting), CLICK HERE. Technical papers and manuals of the 1940s and 50s were full of plugboard wiring diagrams such THIS ONE, from "Mass Spectrometer Calculations on the IBM 602-A Calculating Punch" by W.H King Jr. and William Priestley Jr., in . The IBM Calculating Punch Type 602-A , Principles of Operation, 10th Edition, Form 22-5489-10 (Aug 1955), and other editions and manuals for the 602 and 602-A. The Bashe , Pugh , and Grosch  books. Verzuh, Frank M., "The Solution of Simultaneous Linear Equations with the Aid of the 602 Calculating Punch", Mathematical Tables and Other Aids to Computation , Vol.3, No.27 (Jul 1949), pp.453-462. Hankam, Eric V., "A Card-Programmed 602-A Board", IBM Watson Laboratory (25 Nov 1951). Opler, Ascher, "Card Programming the 602-A Calculator", Dow Chemical Company, Pittsburg CA (1952), 12pp. Schrage, Robert W., "The IBM 602-A Calculating Punch as a General-Purpose Calculator", IBM Technical Newsletter , No.6, IBM, New York (Nov 1953), pp.5-31. IBM Scientific Computing Forum Proceedings and Technical Newsletters from the 1950s are full of articles describing 602 and 602-A applications and techniques.